Then with more than a little triumph in his voice he hit me with his clincher. “I’d be just as happy to play 500-yard shorter courses and put skill back in the game,” as though that proved he was a purist and above questioning by those in disagreement. 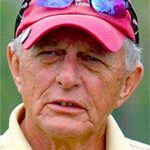 Clearly, he felt folks with the opposite opinion were somehow lacking in the proper spirit of the game and certainly didn’t have the best interests of golf and golfers at heart. Having learned a long time ago when two people are on opposite sides of an issue and one bases their opinion on emotion, pointing out facts is both unwise and unproductive. It most often ends up with a harangue by one or the other which can only mean hurt feelings and usually rising tempers. Since my fragile ego won’t stand a lot of bruising, I opted to shift the conversation to a less controversial topic like politics but not before pointing out his approach lacked even a basic grounding in the facts and ignored some simple truths. My intuitive sense spoke clearly though with the most obvious clue being he looked at me like I had two heads. Don’t get me wrong my new friend is not a bad guy but is typical of those in favor of “rolling back the ball” or bifurcating the Rules of Golf or limiting equipment further or in some other way restricting players’ performance. They have a skewed view of the game’s reality in 2018 and little understanding of its current state. Some even advocate putting things back as they were in the 1960s or 1970s or 1980s. 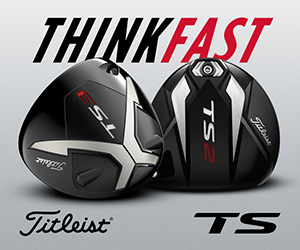 – Though driving distance on the PGA Tour, the best players in the world, has gone up in the last 20 years the scoring average has stayed the same. It’s worth noting that in 1998 the large headed drivers with graphite shafts were all the vogue but a solid core urethane cover ball, such as Titleist’s Pro V1, was not on the market. 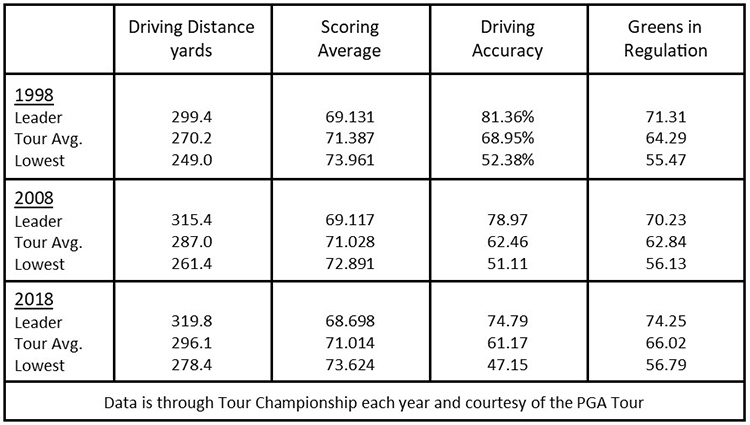 – The second uncomfortable truth is the driving distance of recreational players has actually gone down in recent years. 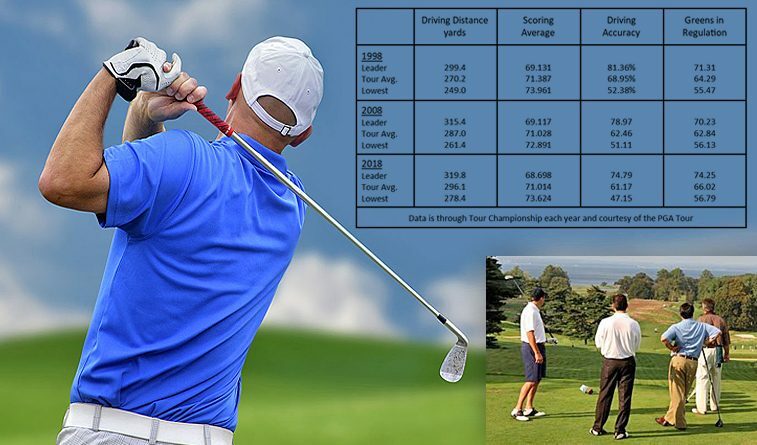 Data collected by Arccos, the real time swing app, shows the average drive in 2018 is 217.1 yards down from 220.6 in 2015. This doesn’t sound to me like there’s a problem other than trying to figure how to add some bonus yards to my own drives when I tee it up this afternoon. The table also reveals Tour players today are significantly less accurate off the tee and marginally better able to hit greens in regulation, neither of which are calls to man the barricades to repel the heathens. In other words, hitting long is good but we all know that’s always been the case. Other than my new friend I have never come across a single weekend golfer who wants to hit it shorter and join the purists that believe this frustrating, agonizing, difficult game should be harder. Logically of course no one should have a problem because today’s professionals generate the swing speed to hit the prodigious drives we love. The purists’ argument is not logical but somehow in their own minds places them on a higher plane with visions of a kilted piper through the mists. 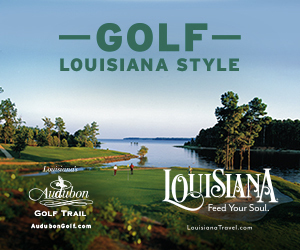 They also ignore the fact golf’s history is filled with one technological improvement after another and indeed it could be argued a major component of the soul of the game is the struggle players go through to take advantage of each new advancement in balls and clubs. Meanwhile realists and equipment makers become the bad guys bent on ruining the game in the name of profit while pulling the wool over the eyes of the consumer struggling to get rid of his slice. Now if we can just get USGA CEO and executive director Mike Davis to back off on his goal to “roll back the ball” before his completes his time in office, I can go back and work on getting my driver to go an extra 20-yards.